Two weeks ago, if you had asked me to tell you everything I knew about the band Throwing Muses, I would have gone dough faced and dead eyed. “Canadian punk band?” I would have un-educatedly guessed. Somehow this foursome escaped my musical reckoning in the mid-80s. I would have been wrong. But that wrongness at least says this: One does not have to be a Throwing Muses Head to want to metaphorically rub lead singer Kristin Hersh’s memoir Rat Girl all over her body in hopes of absorbing a fraction of the smarts, words, and ideas directly into one’s blood stream. Because science is not yet that sophisticated, I settled for turning the book into an origami version of itself, with at least 30 percent of the pages dog-eared. This memoir, shelved in the bi-polar section of your local bookstore, is (for the amusement of using an out-of-character word) so lovely. This is not the gelatinous mess that is a typical celebrity memoir — to be expected as Throwing Muses is not a typical band. (I can say that now. I’ve downloaded plenty of its backlog in the past few days. For free. www.kristinhersh.com). Hersh captures 1985, the year Throwing Muses went from a bar band to label magnet in a series of vignettes and song lyrics, snippets pulled from the journals of a 19-year-old. 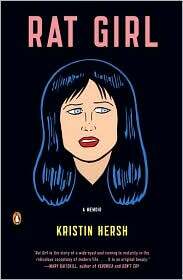 Blue-haired Hersh is squatting in a dead guy’s house, taking college-level classes at a university where her father, whom she calls “Dude,” teaches hippie-based courses that start with deep relaxation exercises of the soul-scorching kind. She breaks into backyard pools in the middle of the night to swim laps to combat her insomnia. Her best friend Betty is of AARP membership age, a former Hollywood starlet who imagines she is one wrong turn from an onslaught of paparazzi. Throwing Muses play gigs at local clubs they aren’t even old enough to patronize, and sometimes get stuck paying a cover charge if they walk outside before their set. Ever since she was hit by a car, Hersh hears music in the white noise around her. And when a song strikes, she must immediately work it out on her guitar. Throughout the rest of the year she will move with her band mates into an apartment in Boston, space shared with other artists, and with Harvard thugs for neighbors. Hersh is diagnosed as bipolar. Throwing Muses will attract a following and get good chatter from local press. Fans will leave gifts on their door step, and a dude with an international phone number will express an interest in signing the band. And, despite any hint that Hersh has ever seen a naked man, she gets pregnant with the band’s baby. These single serving stories don’t make a quote-unquote plot. They are carefully worded, and artfully selected moments in a life — many that inspired lyrics. They reveal Hersh to be genuinely surprised that Throwing Muses have fans, and even a little ambivalent about it. Her three band mates just make cameos, but they are drawn so tenderly. Not the way one would write about family, but with the soft touch one would use to write about a partner with whom they are truly smitten. (But Hersh kind of treats everyone like this. From the old ladies on the bus, to the junkies at their shows, her default seems to be liking people as much as is possible for a loner). Rat Girl is light on glitz and glamour. (Hersh describes her style as homeless, and her hugest goal is to tour with her band and live out of a van). It is ripe with introspection and imagery. Hersh’s voice is so unique and her life so interesting that I imagine reading this book is a lot like what music hounds in the 80s felt when they first heard the band. BTW: I judged this book first by its awesome cover. Just a short note to thank you for letting me know Kristin has more stepped back into the limelight. She and the Muses were easily one of the best live bands I ever saw back in the 80s. Egad, just the sight of her singing, her eyes rolled up into her head in a high note….was almost too much back in the day. It made me shaky to see and hear such a thing. My favorite quote from this review? GREAT REVIEW, shows how universal Kristin’s insight is. EFFIN brilliant. I rank her as prophet, up there with The Dalai lama, Muhammed, Jesus and Buddha. The cover of Rat Gilr (by Goilbert Hernandez of Love & Rockets fame) is striking, but the book is so much better. Don’t forget Kristin’s solo albums or her other band, 50 Foot Wave, it’s all good (plus, she wrote one of the most honest and moving Book Notes pieces of the year). Of course, I meant “Girl” (working from home often means a cat on my wrist while typing). It was actually Book Notes that made me want to read it.